I’m a Poor Person, Get Me Out of Here! Thrown into this world, Rachel has to contend with a family that deems her not remotely good enough for their golden boy, digging into her past for dirt to stop their romance, as well as scheming ladies who think they are more deserving of Nick (and his future inheritance). Although mostly Rachel and Nick’s story, we also get to know many other characters, including Nick’s glamorous cousin Astrid, who’s having a rocky patch in her marriage; Nick’s mother Eleanor and her circle of friends, whose meddling has big consequences for Rachel; and Nick’s horrendous cousin Eddie, so obsessed with getting in the society pages that he acts like a tyrant to his family and dresses them in head to toe designer clothes. I almost didn’t review this one. In fact I almost didn’t finish it. About a third of the way in I had grown so tired of how horrible and ostentatious and obsessed with money everyone was that I wasn’t sure I could take anymore. Sure it’s a bit of a parody, it’s meant in fun (I think?) but it was painful reading about people who can drop hundreds of thousands on designer outfits in one afternoon and look at those less well off as somehow lesser than them. I just didn’t want to spend any more of my time with them. Thankfully there’s a decent human being in Rachel (and Nick) that I could follow and root for and hope that she would somehow better all these snobs and maybe also leave them penniless as well. That doesn’t happen (spoilers! ), but then there are sequels, so fingers crossed! As it went on I got more involved in their story and was eager to finish to see what happened. I will be reading the sequels after all. It definitely grew on me as it went on and I’d now like to see how things turn out for everyone. But if Nick’s mother could end up working at McDonald’s or something that’d be great. Share the post "I’m a Poor Person, Get Me Out of Here!" Urgh. If you had a tough time with this one, the second book is not going to be a good time. I’d suggest saving yourself and stopping here. Oh no! But also good to know. I might attempt it, not sure. Maybe I’m a glutton for punishment? For me, a good portion of the fun of the series was the over-the-top consumption. That ramps WAAAAY up in the next book. 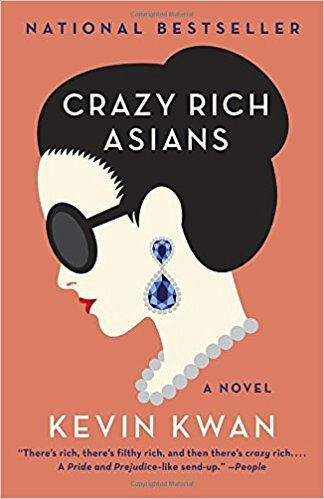 The fictional Chinese billionaire scene is all about the over-the-top spending. The rest of the story kind of drags. I liked the third book, but it’s more family drama because it’s the fight for the grandmother’s estate that you can see coming in the first book. You’d have to be invested in the characters to have any fun with it. If you dislike most of the cast, it’s not your book. I agree with J. The second book is more of a narrative mess than this one. I don’t know if you’ll enjoy it if you had a hard time with this one. The consensus seems to be to avoid. I should listen. Maybe. I didn’t hate the 2nd, but I also really liked the 1st one, so ymmv. All of this. I thought the first one was fun, the second one annoying, and the third one just depressed and annoyed me. Partly I’m curious to see how bad it could be. Also curious about the movie. Hopefully that’s better. However, I will totally see the movie.